Designed to service U-joints on light to intermediate sized trucks, automobile and farm machinery with bearing cups from 1.0" to 1.25". Eliminates dangerous vice, hammering and socket methods and prevent the damages of yokes, driveshaft, bearing cups or joints. Note: Do not use over 1⁄2" impact wrench—doing so will void warranty. Remove all bolts from bearing cups. Slip the U-Joint Puller over the yoke of the driveline. When bearing cup becomes free, repeat process with remaining three bearing cups. Keep forcing screw clean and lubricated at all times. Failure to maintain the spherical thrust washer, located inside the glove will result in excessive wear to the part. Check and lubricate this part (lubricate load bearing surface in glove, under cap, on both sides of spherical washer) periodically and replace as necessary. 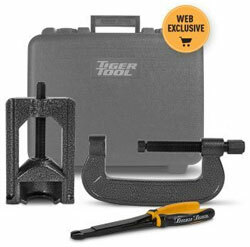 Contact your Dealer or Tiger Tool for replacement washers. (We recommend SAE 30 lube for the threads and EP with molly grease). Place new bearing cup against magnet side of installer. Insert second bearing cup into driveline. Align installer over both bearing cups. Turn forcing screw by hand or with impact wrench. Both bearing cups will be pressed in at the same time. Repeat process on two remaining bearing cups.